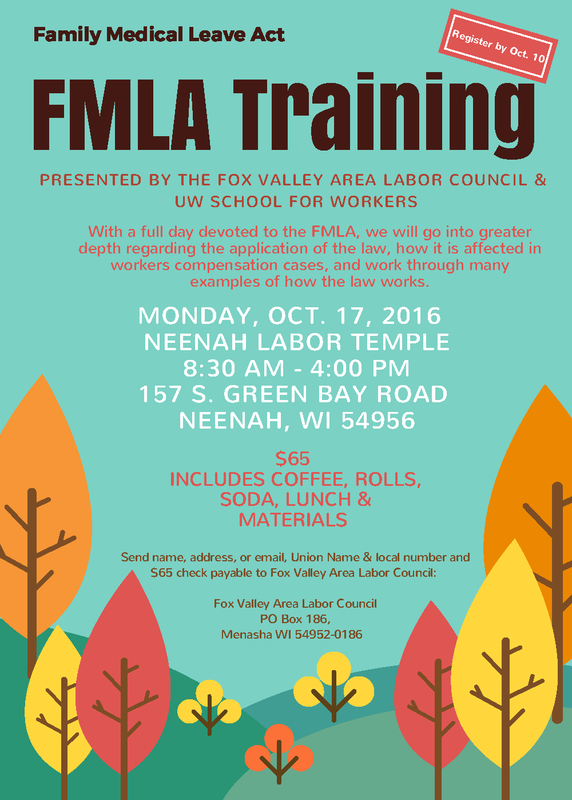 The training by the Fox Valley Area Labor Council and UW School for Workers will devote a full day to the Family Medical Leave Act (FMLA). It will go into greater depth regarding the application of the law, how it is affected in workers compensation cases, and work through many examples of how the law works. You can sign up by sending your name, address, email address, union name and local number, along with a $65 check payable to Fox Valley Area Labor Council, PO Box 186, Menasha, WI 54952-0186. Please join Wisconsin Faith Voices for Justice for our Annual Meeting! This past legislative session, legislation was introduced that would guarantee all Wisconsin workers access to paid family and medical leave. The bill even received a public hearing in the Senate! Let's urge state legislators to build on this momentum so that paid family and medical leave is a reality for all Wisconsin workers. Click through to this petition from 9to5 Wisconsin for an easy way to tell your legislators that you support the Wisconsin Family and Medical Leave Insurance Act. To learn more about paid family and medical leave and why it is important to those who labor in Wisconsin, visit our page on the issue.